While for some of us the concept of internal marketing is something familiar the role of this marketing strategy is still highly underestimated in today’s market. We propose a picture view in 5 phases on how the concept evolved and we also state that IM will constantly change as long as the world of business changes. There are still markets and businesses where, the power does not belong to the customer. Therefore, there is no pressure to care about marketing in general, and moreover about IM since there will be no direct effects on the business. Another characteristic of these businesses is that workforce is not a problem. We can understand better if we think about people working for the government as an extreme example. Money and benefits are good, positions usually come with low responsibility and for some employees it’s the ideal job. At the same time, management can be: politically named, uneducated, uninterested in their employees’ opinion or motivation, less concerned about the beneficiaries of the organization services – let’s say the customers – because usually there is no competition. 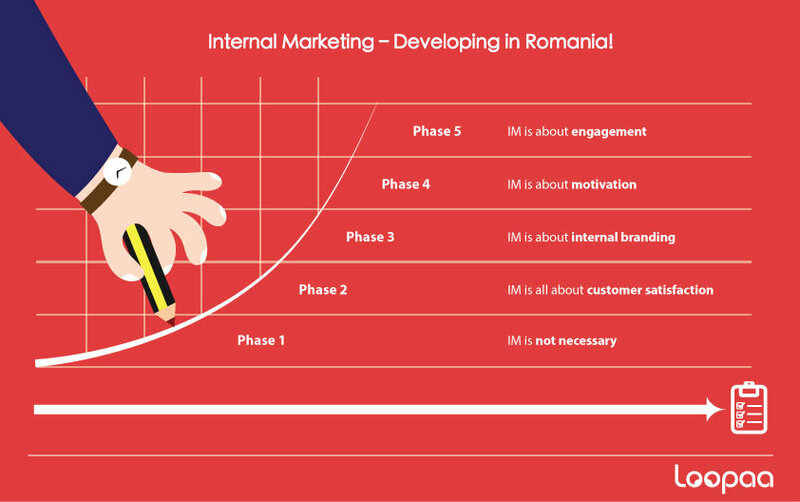 Many analyses about origin of IM concluded that IM with its strategies, tactics and theories were destined to create a better customer satisfaction. It is still a consequence of IM practices even if the IM does focus on better defined objectives nowadays. 5. Employees must be able to identify and solve customers’ problems. The IM responsibility is still in the hands of management and sales management, while HR follow their requests sales oriented. What is new here is that the activities focus more and more on selling the company brand to employees. IM concept aims on “… attracting, developing, motivating and retaining qualified employee” Berry &Pasuraman (1991). * The concept of internal marketing is a tool that companies use within their workforce to communicate with their employees. * Education…. employees need to be educated on its aims and goals. Everyone in the company must know what the goals of the plan are an d how they are going to be achieved. * An internal culture created by the managers of an organization. This culture allows employees to express their creativity and innovative selves to an extent where they still show responsibility and accountability. * Just as innovative is the extension of the idea of one set of people within an organization becoming customers to another group within the same organization. Even this concept existed in a different form in the profit-centred concept, internal customer satisfaction is activated as an IM concept. Branding also involves employees, their image and voice are part of the company’s brand, this also assuring performance recognition and higher retention rate. Here is the phase where competition makes the difference. When you have a sector with hundreds of open jobs, professional reconversions, private universities to form the necessary employees, new investors announcing development or new offices … The IM focus changes. Most successful applications of IM typically talk about improved motivation, leadership, team – building and working relationships which are nothing but pure and simple HRM principles. However, employee recruiting, motivation, satisfaction, retention and referral programs are now priority ZERO, otherwise opportunities might be lost and also, competition could st ill your employees. HR departments looks like guerilla sales departments and head hunting become common used in recruiting. Benefits and incentives demand creativity and they get an important share of personal costs. Breaking down negative perceptions of one or more aspects of the company is also an IM objective in this phase. Above a certain level, HRM need help on CREATIVITY and COMMUNICATION CONCEPTS . Here we are talking about a mariage between Marketing and HRM. Fundamentally, both marketing and HRM deal with people. At this core level, there are definitely a number of concepts such as attitudes, motives and satisfaction which can be easy understood when fixing the IM objectives. It is not the same thing anymore, you need a higher rate of success when presenting the company to potential employees, communicate internally, organizing internal events, etc. Being here, next phase after motivation becomes even more challenging. In this phase HR is considering the TEAM effect in getting their job done. HR department efficiency starts depending on the engagement of the employees in their mission on assuring motivation and necessary workforce to the management. In conclusion: The best business leaders understand that IM communication is a core business process. They invest in it. They nurture it. They make it a competitive advantage. Trends are important. Are your IM communications mobile friendly? Are you using videos internally? Are your internal print ads creative enough? Are your employees ambassadors of your company’s strategy? If you need assistance in implementing an Internal Marketing strategy, we can help.